JG Thirlwell’s Manorexia will be playing at the All Tomorrows Parties event curated and headlined by Portishead on Oct 2nd. The event will span a three day weekend: Sep 30th, Oct 1st and Oct 2nd. Jeff Mangum (Ex Neutral Milk Hotel) will curate and play on the 30th. 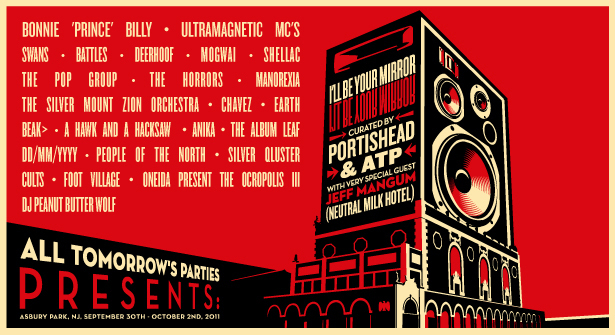 October 1st and 2nd will be curated by Portishead, and they will play both nights. This event marks All Tomorrow’s Parties return to the USA in the new location of Asbury Park, N.J., bringing an “I’ll Be Your Mirror” event to the iconic Asbury Park waterfront. This will also mark Portishead’s first East Coast appearence since 1998. Other acts confirmed over the weekend are Battles, the Pop Group, Swans, Deerhoof, Mogwai, Shellac, Bonnie Prince Billy, Ultramagnetic MCs, Beak>, A Hawk and a Hacksaw, Cults, Earth and many more. For full details and tickets vist the All Tomorrows Parties website. The new Manorexia album, Dinoflagellate Blooms, will be released in May 2011 on Ectopic Ents. The special package will contain both stereo and 5.1 mixes of the album.